You can specialize in a type of postal history, such as just postal stationery, just covers of a particular rate, advertising covers only, hotel covers only, etc. You can specialize in the postal history of a particular value of the series, such as all uses of the 5c for example. You can specialize in short-paid mail from the period and so can look at mixed frankings with the first postage due issue, as well as shortpaid mail rated by hand and not franked with postage due stamps. You can specialize in the postal history of a specific domestic region or town, such as collecting everything to do with Cobourg, Ontario for instance. You can specialize in foreign destination mail like say, all the covers from this issue going to Jamaica, or the British West Indies. You can look at all non-cover uses of the stamps, such as cancelled cheques franked with the stamps used as revenues, bulk mailing receipts franked with the high values, acknowledgement of receipt forms franked with stamps, registration receipts franked with stamps. These are just a few ideas to get you thinking. 1c green and 2c red envelopes that measured 152 mm x 88 mm. Die 1 lettering is thin, and there is a long bar in the "G". Die 2 lettering is thick. The top bar of the "E" in "One" is shorter than the bottom bar. Short bar in "G". Die 3 is as die 2, except that the top bar of the "E" is longer and the "E" in "Cent" is raised. Die 1 lettering is thin. The bottom left point of the bust is between the "WO" of "Two". The bar of the G is long. The panel lines above "Cents" are extended, intersecting a loop. The border loops are even and join the frame. Die 2 lettering is thick. The bar of the G is short. The border loops are high, even and join the frame. "D" of "Canada" is low. Die 3 lettering is thick. The "D" is normal and the border loops are flat. Die 4 border loops are uneven and seldom join the frame. The bottom tip of the bust points at the "O". Die 5 border loops are as die 2 and the remaining characteristics are as die 4. Die 6 is as die 5 except that the bar of the "G" is long with a vertical serif and the centre bar of the "E" is very thick. Albino impressions of the stamps. The stamp impression on the inside of the envelope rather than the outside. The stamp impression in the wrong place, when it should be in the top right corner. Double or multiple impressions of the stamps. Complete extra stamp impression on the front of the envelope. Offset impression of the stamp on the inside of the envelope. I do not know if all of these varieties exist on this issue, but I imagine that they all should exist, and can be found after examining a large number of envelopes. The wrappers exist in a wide variety of paper colours and a very rarely found intact and undamaged, especially when used. Such items are worth a considerable amount of money in clean, undamaged condition. The postcards are often found with printed designs in the corners or on both sides of the cards, as businesses would buy them and then print what they wanted on them. These are often in such pristine condition and are often found uncancelled, but are in fact used. 1c items were intended for either the printed matter rates in the case of post bands, wrappers, and business postcards, the postcard rate in the case of most postcards, or the drop letter rate in the case of envelopes. The 2c items were intended for either the double weight printed matter rate in the case of the wrappers, the foreign postcard rate for the 2c blue postcard, or the local and U.S. letter rate in the case of the envelopes. 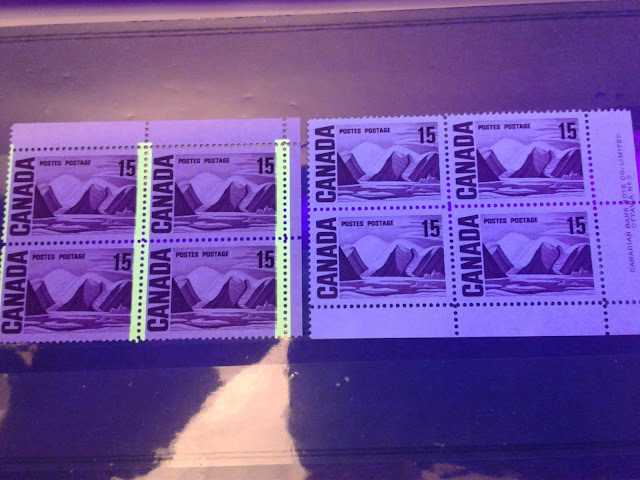 Occasionally one finds these items uprated for other rates, by adding additional postage stamps to the item to make up the higher postage rate. This is yet another possible field in which you can focus your collecting. Such items are generally scarcer than the items used for their intended purpose. Hotels during the period often had very elaborate stationery showing a picture of the hotel, the name and location. These are highly sought after by collectors who specialize in just these types of covers. Most businesses during the period would have their name and location printed in the top left corner of the envelope. These are called "corner card" covers. While most corner cards are pretty plain and not worth much more than $2-$3, they can occasionally be quite elaborate, scarce and worth quite a but more than $2-$3. Occasionally one comes across full colour advertising covers that have the advertisements occupying either the front of the cover, the back only, or both sides. These are now the most sought after of all the local covers and bring anywhere from $75 for a front or back ad that is not that spectacular, to $250-$300 for elaborate ads that occupy both sides of the envelope. Only a a decade or two ago, these could be plucked out of dealers' junk boxes for just a few $. Then of course, the covers can be made more desirable by the markings that are on them. First day covers would be very scarce and worth a considerable amount of money. Remember July 1, 1903 is the relevant date for all values but the 20c and 50c. The actual date of issue for the 50c is unknown, but presently the earliest recorded date is October 6, 1908, so any cover dated prior to that would be a real prize. The issue date of the 20c is September 27, 1904. I have not heard of a first day cover ever being found for this, but one may indeed exist. In addition to first day covers, certain town cancellations and railway post office (RPO) cancellations are scarce and desirable and can take an ordinary $2 cover up to $25-$50 in some cases. In order to know which ones are which, you would need to be come familiar with one of the many books that have been written on the post offices of a particulae province. The high values are rarely found on cover. The best known and most valuable cover recorded in this series is shown above. It was in Ron Brigham's collection and was a partial money packet sent to the Molson's Bank, and is franked with $2.05 in postage, which likely covered insurance on the money that was sent. Single usages of the 10c, 20c and 50c on cover are worth in the hundreds of dolars per cover. The 7c value is quite commonly found on local registered covers, as it was used to pay the 5c registration fee plus the 2c local rate. Such covers are usually worth $25-$50 depending on condition and where they were going. The 5c value is usually found on foreign covers to Europe and British Commonwealth countries. Single usages are not that rare and typically sell for $50-$75, again depending on condition and destination. The common destinations would be the UK, followed by the Western European Countries. Eastern Europe would be worth more, as would Commonwealth nations outside Europe. As I had said in my earlier overview post about this issue, this was the Golden Age of the postcard, with many postcards being of a very high artistic quality, such as the one shown above, which was printed in Germany. The scarcest cards are those that had no dividing line on the back, as the old rule was that you could only put your address on the back and no message whatsoever. Often people would get around this by writing on the front of the card. In 1907, the rules were relaxed, and written messages were permitted on the left side of the back of postcards, and so you see cards after this date being printed with a dividing line down the back. In addition to these paper cards, there were also cards embroidered in silk and cards made out of wood and leather. These are scarce, as they would have been very expensive to produce at that time. Particular themes, such as Thanksgiving, New Year, Easter, St. Patrick's Day, and so forth. Scenic cards from specific places. Particular mail routes, such as a specific railway. The scenic cards are by far the most common, and very few are rare. The better cards will be those which depict landmarks that no longer exist, ghost towns, or places in existing towns that have changed so much as to be unrecognizable from what is shown on the card. The event cards are scarcer, but again are fairly common. The thing to look for here is extraordinarily colourful or detailed artwork such as that on the card shown above. That concludes my post about the postal history of this issue. My next post will be the last one dealing with this issue and will talk about the proof material and plate multiples of this issue. Then I will move on to posts about the beautiful 1908 Quebec Tercentenary Issue.